At the far end of the Narthex is the Lady Chapel, the centre piece being a fine marble statue of Our Lady. The statue was given to the church by Mrs. Myerscough. The work was executed by Messrs. Barsanti and Sons, of Piazza de Duoma, Pisa, Italy. Guild of St.Anne walked in their May Procession. 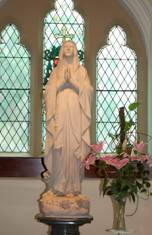 Like the statue in the Grotto, it is a representation of Our Lady of Lourdes. Until the recent new entrance was built it was situated at the South end of the narthex, and prior to that at the right hand side of the Main Altar. The brass rails are part of the original altar gates. The stained glass window shows the Arms of Thomas Flynn, one time Bishop of Lancaster, and Parish priest of this parish 1934-1939.